This is to let you know that we are gradually reaching the anticipated orders and therefore, please place your order as soon as possible to avoid disappointment by contacting one of the organizers. We will be accepting orders until midnight September 16, 2016 only. The success of our Annual Sri Lankan Food Fiesta Fund Raiser event solely depends on the involvement & participation of our dedicated members and well-wishers in a voluntary capacity. For the forthcoming event on Sunday, September 18, 2016, we have scheduled voluntary activities into several groups as follows. From 10:00 AM – 4:00 PM: Volunteers for serving food to the customers – waiters & waitress. The services of three or four dedicated volunteers to handle the orders at the front counter. We need dedicated 12 to 15 young adults of age 14 and up to serve as waiters & waitresses. Our plan is to divide these young adults into three groups so that one child has to work only two hours between 10:00 a.m. to 4:00 p.m.
We kindly request Dhamma School parents to bring your sons & daughters to help us out. If you can bring your children, please co-ordinate the availability and timing with Athula Thilakaratne by contacting @ 604 448-2174. We request all waiters, waitresses and food serving staff to wear a white shirt and a black trouser as well. 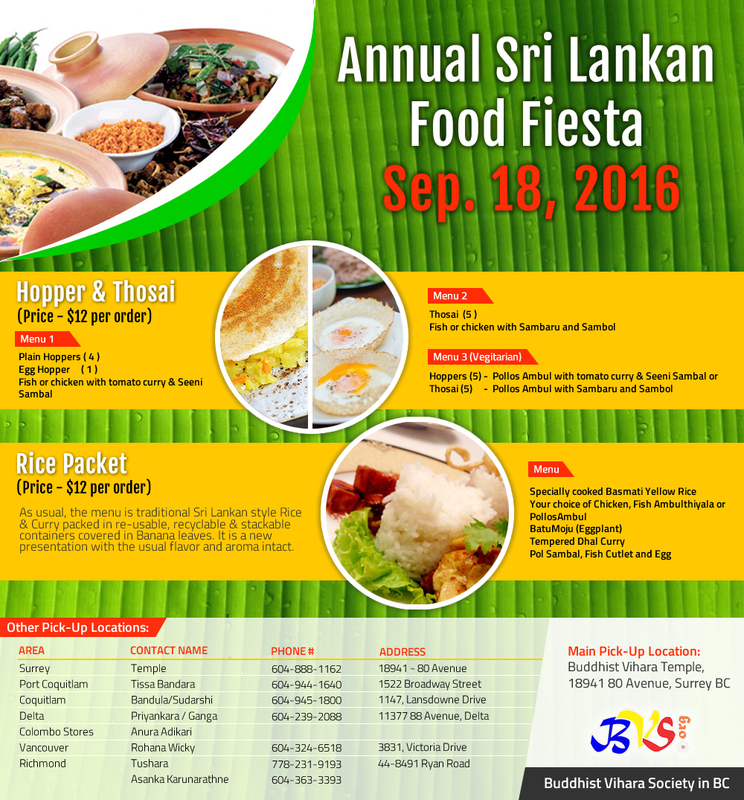 From 8:00 AM – 3:00 PM: Preliminary preparation of food, setting up of tables, cleaning the premises, etc. Few volunteers are required for the preparation of rice packets. If you are interested in helping, please contact Anura Adikari @ 778-394-8699 for details & to sign up. From 2:00 PM – 4:00 PM to clean up the location.